On the 7th of February 2019 brimstone keys and chests got released. We looked up all information for brimstone keys and chests and will summarize it all up to you so you don’t have to do the digging yourself. A brimstone key is a key that can be used to open the brimstone chest. You can get these brimstone keys by doing slayer assignments, but not just any assignment, you’ll have to do assignments given by Konar quo Maten, which is a new slayer master that got released on the 10th of January 2019. Finally, you can use these brimstone keys on a brimstone chest which will give you rewards, but we’ll give you more information about that later in this article. In order to obtain brimstone keys you’d need to know where to find Konar quo Maten first and know the requirements in order to be able to receive an assignment from Konar quo Maten. The first step is to find slayer master Konar quo Maten, you can find him in the Kahlith settlement on Mount Karuulm (volcano). You can find Mount Karuulm on the north side of the Kebos Lowlands. 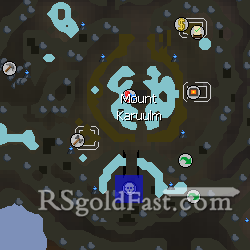 The fastest way to get there and find the slayer master is by using Rada’s blessing 3 or 4’s teleport, this teleport will take you to the top of Mount Karuulm. There are some requirements for this teleport: you need full completion of the hard or elite Kourend & Kebos Diaries. If you do not meet these requirements, don’t worry, as you can easily reach Konar quo Maten by heading north of the Farming Guild (you can find this teleport on the Skills necklace or the Farming cape), or head north from the Battlefront teleport or c*i*r fairy ring. Fun fact: slayer master Konar quo Maten is quite unique, because Konar will give you a specific location where you’ll need to complete the assignment. Let’s say if you get assigned an Abyssal demon task, Konar quo Maten can direct you to kill the Abyssal demons in the Slayer Tower and Slayer Tower only. Once you’ve found slayer master Konar quo Maten and got a task assigned from Konar, you can start grinding your way to brimstone keys. Obtaining the brimstone keys is very simple, all you need to do is kill monsters on your assignment from slayer master Konar quo Maten. You will not receive a brimstone key with every monster you kill, but you have a chance to get a brimstone key drop. 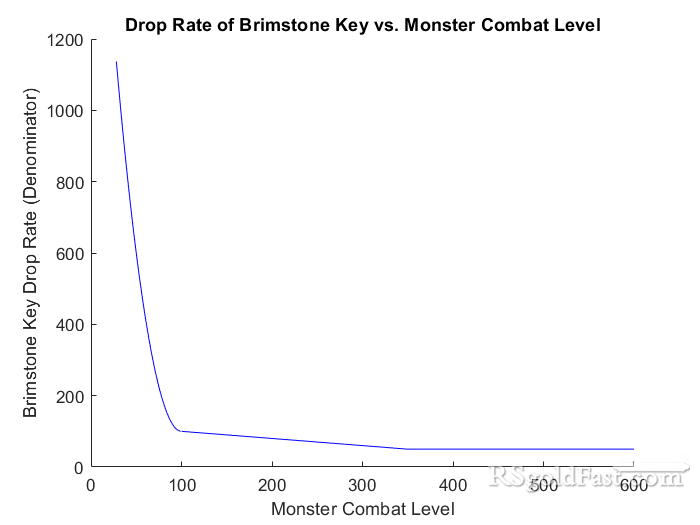 The odds of a brimstone key drop depend on the monster’s combat level. When you kill a level 100 or higher monster, the odds are between 1/100 and 1/150, the odds scale but cap at level 350. You can calculate the odds of monsters level than higher 100 with this formula: (-0.2 * level + 120). When killing monsters lower than level 100 it follows a curve, you can use this formula: (0.2 * (level - 100) ^ 2 + 100). You can find the brimstone chest next to slayer master Konar quo Maten on Mount Karuulm. In order to open the brimstone chest you’ll need to have a brimstone key in your inventory, which you obtained by killing monsters that Konar quo Maten assigns you. In general, the brimstone chest contains generic loot which is meant as a little increase to the player’s profit. Notable items are the broken dragon hasta and the pieces of the dusk mystic robe set. There’s a rare chance that you get a broken dragon hasta, when you get this broken hasta you can repair it for free by showing it to Otto Godblessed. There’s also a little chance that you receive pieces of the dusk mystic robe set as loot. These mystic pieces come with a colour scheme which is similar to the colour scheme of Mount Karuulm. There are tons of other items you can get from the chest, but nothing worth a fortune. For example, you can get noted tuna, lobster, swordfish, shark, turtle, manta rays, runite ore, steel bars, magic logs, dragon dart tips, seeds, pure essence and gems. On average, you can expect the value of the loot to be approximately 102,000 OSRS GP. It's so long! 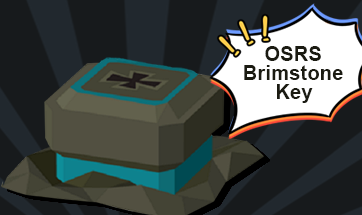 Thank you for reading "OSRS Brimstone Key Guide 2019" on RSGoldFast! We will offer more useful runescape guide for you, and also offer the best runescape gold & other runescape products here, thanks again.